At the moment there isn't much information, but apparently the game will have a secuel! It seems that Azpiri is back in the 8 bits... it looks really great! The 8bit team: JavyMetal, Rafa32 & Errazking. studio co-workers: Azpiri & daughter, Gryzor (locomalito) for the music and effects, Pau (graphic artist from Mexico), Raul Nogales for the PC version. The idea is to release games continuosly and if all goes well, physical editions. Soon more screenshots of the game. Quite impressive, how can they do so many versions? CPC, MSX and ZXspeccy share common CPU and have some common graphic specs (256x192 or 128x192 on CPC)... it is not the biggest deal to perform a full cross-port while at original dev. Same with tilesets, better to do all of them with variant for each Machines if same dude performs it at development step. Also I guess all game production company would do many versions for many machines already in the 80s. Can't wait for a nice RPG on CPC at last. Yes but you are not using them specific features of every computer. I mean, probably base version will be Spectrum one (as in 80s) and other versions (MSX, CPC) will be simply ports. In any case, CPC doesn't support any resolution similar to Spectrum (128x192 is not directly supported unless you uses cropped mode 0). Mode0 = 160x200, Mode1 = 320x200, Mode2 = 640x200. To use same tileset it will be probably a cropped Mode1 game. If you want to know if there are only spectrum ports , the answer is no. 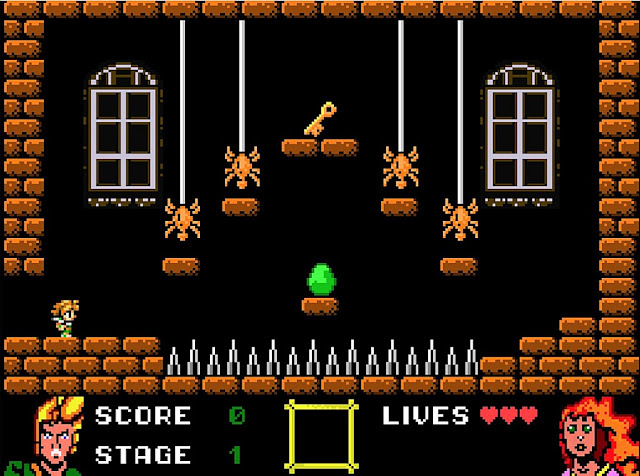 The CPC game is on mode 0, and his sprites & tiles are designed especially for CPC, like all other versions. At this point there are versions of every 8 bit machine runnig the game, but the CPC version is still the most advanced version, (I only have 2 weeks programming 6502 ASM). Working cpc version. Testing graphics. Not much changes since the 80s, still the spanish and french are bang on it with some exiting games! Oh wow, I'm ready to back this, but it's a bummer that the only retro physical edition that makes any sense is the MSX cartridge at €50 (+€30 for shipping???!!!). Plus they don't have tiers for the (lovely) t-shirts apart from the mega-donor ones,so it kinda forces you to spend less money. Yeah, the funding goal, stretch goals and above all the prices for a physical edition are completely outrageous. I was really interested until I saw the prices. These guys are way out of touch with reality. Too bad. this week we will do an update of prices, rewards, shipments and clarify many issues. Well, I can appreciate the efforts put into development, but gating "interesting" content (as I assume it would be given the price) behind a 100€ price tag when I can get most homebrews for free and commercial CPC stuff for 15-30€ (think Doomsday, Orion Prime, Magica, Cahautemoc...) is beyond shocking. I'm not sure what on earth could possibly be worth a 75€ markup! Now, I know that I could get the game for CPC (changed from the 100000€ funding goal you initially had posted, which is a marked improvement - in fact my reaction came from the initial funding goal) for 25€, but a barebone release on tape for that price is weird (see Matranet, Polyplay, Binary Zone, Cronosoft... for reasonable prices). To put things into perspective I didn't even pay 25€ for Shovel Knight, which is by far the gold standard in retro gaming and offers tons of content, not even commenting on the additional DLCs. Maybe putting pictures of what we'd get for the base edition and collector's edition would go a long way to prove me wrong (and I'd love to be proven wrong and support your endeavour). I don't mean to be so harsh, I actually welcome any new game & want to support any effort, but this is dangerously close to highway robbery (it is to me). I'm glad some people feel like spending this much on something unproven, but a 25000€ funding goal is a big ask without any kind of demo, details, pictures of the physical release (even a mock up would be a great start). I'd say, let's not get into price discussions. We've been over these issues time and again. If the guys think it'll cost that much (remember, it's a multiple-platform release), then that's that. If someone thinks it's not worth it, don't buy it, and preferably start another thread to discuss retro releases pricing. The structure looks better now, but I'm a bit confused I pledged €15 and now the tier is gone. Now there's a €7 tier for digital releases and a €12 for a physical copy. Do I downgrade? And how do I get both physical and digital? And how do I get the CPC physical, the digital 8-bit AND the PC release? And what exactly is the 8-bits collectors' box? And is the €150 tier the only one where I can get a t-shirt? -it needs more publicity. Feel free to take over the Wiki's front page if you want to communicate it! Do you want to put an announcement on the forum? Send an email out? Let us know how we can help!